This exposes some interesting differences. 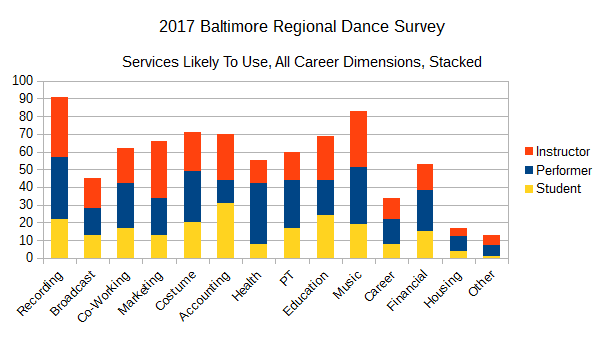 Performers are noticeably more interested in Costuming, Health and Wellness, Physical Therapy, Financial Assistance, and Housing than student or instructor respondents. Instructors are more interested in Marketing. Somewhat surprisingly, students are most interested in Accounting/Business services. A particular standout in this view, Performers are more than two and a half times as likely to engage Health services. In this view, we see that Recording services are now the most in-demand (due to a significant overlap between Performer and Instructor responses). 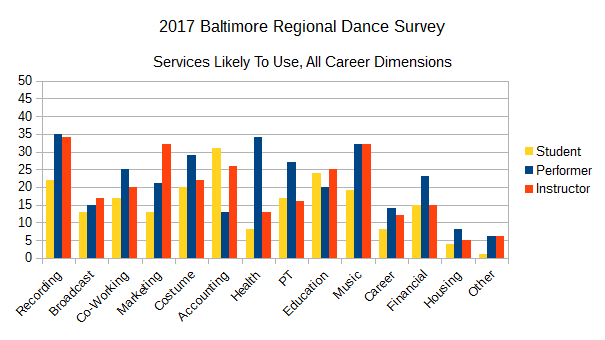 In the first chart, demand for Marketing, Costume, Accounting, Health and Education were nearly identical (40 or 41 respondents each). 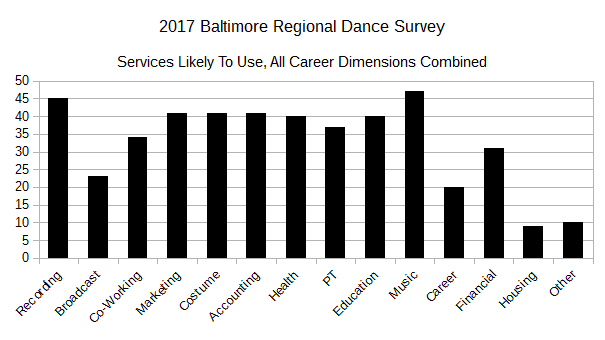 Now, with the extra dimensions exposed, the potential demand for Costume (71), Accounting (70), and Education (69) remain similar, but they all exceed the potential demand for Marketing (66) and, in particular, Health (55). Before we leave this subject, what did the 13 categories miss? A total of 11 respondents picked “Other” for some dimension of their dance career. Descriptions of “Other” provided by instructor-track respondents included “Observing other teaching styles,” “Word of mouth,” “Fitness,” and “Professional development in pedagogy.” Descriptions of “Other” provided by performer-track respondents included “Mathematical dance analysis,” “Finding professional dance training,” “Workshops with other teachers,” “Grant writing assistance,” and “Open studio space.” Some of these could be shoe-horned into the existing categories, but it’s great to have the information as specific needs. I honestly don’t know what “Mathematical dance analysis” means in this context, so if that particular respondent would like to reach out in some form, it’s a really intriguing phrase, and I’d love to discuss it.